I have to admit that EZDrummer tends to be my go-to drum kit plug-in, as it offers just the right amount of flexibility without being over-complicated. It also benefits from new expansion kits added every few months, so it covers pretty much all genres. The latest kit covers classic rock and modern metal. Rock Solid EZX features modern drums recorded at the Warehouse Studio in Vancouver, Canada. 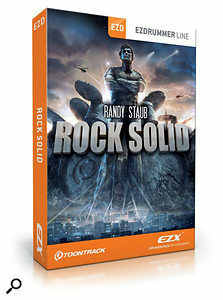 It was engineered by Randy Staub, who has worked with bands such as Metallica, Motley Crue, Nickelback, Bon Jovi and Alice In Chains and, with such a provenance, he should know as well as anyone how to create the definitive rock drum-kit sound. The drums provided are taken from three complete kits with the usual choice of extra snares, kicks and cymbals called up by the menu tabs on the drums themselves. All have that characteristic close-miked rock sound with lots of attack, but the mixer section also allows you to bring in the room mics (mono or stereo) and compression, for a more brash, lively sound. Underpinning the low end, we have a choice of kicks, including 18-inch, 22-inch and 24-inch Ayotte Customs, an 18- by 22-inch Gretsch USA Custom and a 14- by 20-inch 1960s Ludwig with the front head removed. The info section even tells you what type of head was fitted. The choice of snares includes models of different sizes from the likes of Ayotte, Keplinger, Gretsch, Ludwig and Jeff Ocheltree, and the collection offers plenty of tonal range. These sound just the way rock snares should. Again, our toms come courtesy of Ayotte and Gretsch, but there is also a range of sizes from Dunnett. All this is teamed with an impressive choice of Zildjian hi-hats, crashes, rides and Chinas. The kit sounds available here are suitably solid and deep for the intended style, but with an attack and presence that can cut through a rowdy mix. There's also a variable amount of brashness as you bring up the room mics. Experimenting with the compressor fader can also add weight to the sound.